LLCC is a college with a vision, one made possible by a generous community. Whether you are a current donor or considering a first-time gift, when you give to the LLCC Foundation, you share in the college’s commitment of providing excellence in education. There are many giving opportunities available to meet your needs, as well as those of our students. You can learn more by reading the information below, or you can contact a foundation representative for a personal meeting. 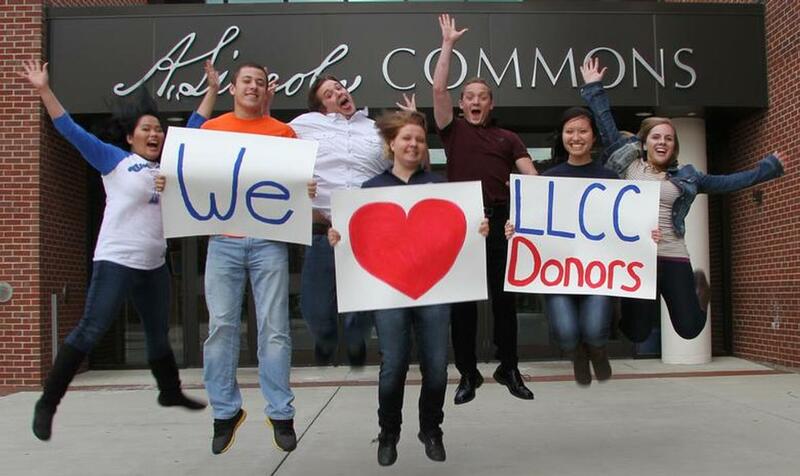 E-mail us at LLCCFoundation@llcc.edu, call (217) 786-2785 or click donate now. Thank you! For more information on the Annual Fund, call the LLCC Foundation at (217) 786-2785 or e-mail us at LLCC.Foundation@llcc.edu. When you shop on AmazonSmile, the AmazonSmile Foundation will donate 0.5% of the purchase price of eligible products to LLCCF. We invite you to support LLCC students with your Amazon purchases. Order an engraved brick today and take your place in the history of Lincoln Land Community College! What better way to celebrate your community college than to etch your name in history? Purchase an engraved commemorative brick today and help students for generations to come! SteppingSTONES bricks are located just outside of the A. Lincoln Commons on our Springfield campus. Proceeds from the SteppingSTONES brick initiative benefit Lincoln Land Community College Foundation’s Grow Beyond Endowment Fund. 3 lines of 17 characters allowed (including spaces and punctuation). 5 lines of 17 characters allowed (including spaces and punctuation) or company logo based on approval. The LLCC Foundation reserves the right to refuse printing of any inscriptions for any reason, including but not limited to requests containing inappropriate messages as determined by LLCCF in their sole discretion. I have proofed the above wording and agree it is accurate and ready for engraving. If an error is discovered after installation and it was my mistake, I agree that I will pay the additional cost to correct. Errors made by the engraver will be corrected free of charge. No refunds available. First and foremost, it is about students. A strong endowment fund is one of the most important things we can do to ensure a strong future for students today and generations to come. With endowment funds, only the earnings are spent annually, while the principal continues to grow, supporting needs well into the future. Whatever the educational challenge, the tradition of the LLCC Foundation Endowment Fund has been one of stepping forward to answer the need. Your generous participation will forever change our students’ lives…now and in the future. For more information, call the LLCC Foundation at (217) 786-2785 or e-mail us at karen.sanders@llcc.edu. Through a planned gift, you can leave your legacy at Lincoln Land Community College, one that will make a difference for generations to come. Planned gifts – in the form of wills/bequests, life insurance, pooled income funds, or charitable remainder trusts – can be made in any amount and directed toward any purpose. In addition to immeasurably benefits that these gifts provide to the LLCC community, they can also provide favorable financial benefits to you in terms of tax savings, income streams, and investment advantages. Due to the level of commitment often associated with a planned gift, we encourage you to consult with a financial advisor and legal counsel, along with the foundation staff, when considering this generous donation. If you would like more information about how to include the Foundation in your will or how to make a special gift to the College that provides you with annual payments, tax savings, and other benefits, please contact us at the address, telephone number, or e-mail address below. NOTE: This information is provided as an education service. Personal advisors should always be consulted. Annual – A recommended amount of $1,000 is suggested. Endowed – A minimum gift of $10,000 is invested, which may include one-time cash gifts, stocks and pledges. Only the net income is used, leaving the principal intact. As a donor, you may name your scholarship, and determine the goals and standards that students must meet. The LLCC Foundation also hosts an annual Scholarship Reception to give you and your student recipient an opportunity to meet. Please know that gifts of all sizes are welcome and appreciated. The LLCC Foundation also has a General Scholarship Fund and emergency fund among others that provide you with other options to help students. If you are interested in establishing a scholarship with the LLCC Foundation, please contact us at (217) 786-4502, via e-mail at LLCC.Foundation@llcc.edu or visit our Scholarships page on this web site.